Weather and other delays marred what had been anticipated as a banner day for space launches Tuesday, as both SpaceX and Blue Origin were forced to postpone launches that had been scheduled to take place within minutes of each other. Both companies say they will look at moving their launches to Wednesday morning. Blue Origin says its launch was scrubbed due to what the company calls a "ground infrastructure issue." Blue Origin says the rocket remains ready. SpaceX says an abort order was triggered by the flight computer onboard the Falcon 9 rocket. Paired with an earlier delay due to unfavorable upper-level winds, the slowdown pushed the rocket past its launch window. "Vehicle and payload remain healthy," SpaceX said via Twitter, adding, "next launch attempt is tomorrow" at 9:07 a.m. ET. In addition to those missions from two of America's top private space companies, two other space launches had been planned for Tuesday — but only one of them is now still scheduled. The delays threw cold water on a day that had left some space aficionados giddy with excitement. "If you're a space fan, Christmas comes a week early this year," Space.com wrote of the four planned launches. 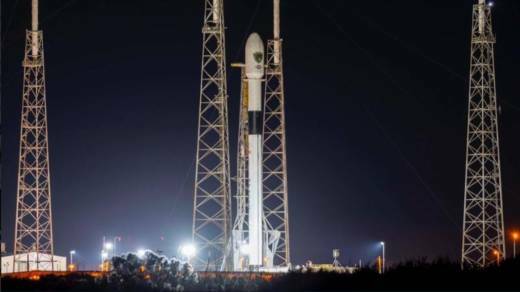 SpaceX was poised to send its Falcon 9 rocket from Cape Canaveral Air Force Station in Florida, with a live webcast that started streaming about 15 minutes before the intended liftoff. SpaceX plans to carry the first GPS III satellite into medium Earth orbit; it comes from Lockheed Martin, which says the new system will "launch the next generation of connection." Because of the satellite's weight and flight plan, the Falcon 9 will not return for a landing. Instead, it will be sent into the atmosphere to prevent space junk from accumulating in orbit. The new GPS III satellites are designed to be three times more accurate than the current system, which went into civilian operation in the 1990s. As for how it might affect regular GPS users, the firm says, "our phones will receive an upgraded GPS signal from this satellite by the end of 2019." Vice President Mike Pence was in Florida for the now-delayed SpaceX launch. Blue Origin had targeted 9:30 a.m. ET to launch its New Shepard rocket for a suborbital flight from its facility in West Texas, in the tenth mission for the reusable rocket system. The New Shepard (named for astronaut Alan Shepard) will carry nine different NASA-sponsored research and experimental projects that have come from five colleges and several agencies and engineering firm Controlled Dynamics. The day had promised four potential launches — but then the delays took hold. The final launch of the day is planned to take place in California, where the United Launch Alliance will send a Delta IV Heavy rocket up from Vandenberg Air Force Base at 8:57 p.m. ET. It will carry a U.S. National Reconnaissance Office satellite called the NROL- 71, which the Air Force says will help to give "innovative overhead intelligence systems for national security." Around midday Tuesday, Arianespace had planned to launch a Soyuz rocket from the spaceport in French Guiana to carry a French defense and intelligence imaging satellite designated CSO-1 into orbit. That's now scheduled for Wednesday at 11:37 a.m. ET. Copyright 2018 NPR. To see more, visit www.npr.org.